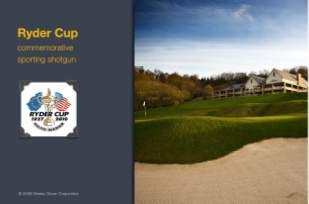 A specially commissioned shotgun will go on display at this year’s Ryder Cup at The Celtic Manor Resort in Wales to celebrate the sporting links between shooting and golf. The Ryder Cup, a biennial shootout between the top golfers of Europe and America, has grown into one of the biggest events in world sport with a potential global television audience of one billion viewers. To mark its first ever staging in Wales this October, specialist gunmaker Holloway & Naughton® was commissioned to create the bespoke 12-bore game gun. The gun features intricate engravings from the world-renowned Welsh engraver, Phil Coggan. His images include a detailed portrait of Samuel Ryder, the seed merchant who created The Ryder Cup back in 1927. Also, depicted in gold, is a Welsh dragon, national symbol of Wales and a bald eagle to represent the American visitors. The Ryder Cup itself is featured on the top lever in the finest detail. A striking European flag is blued onto the trigger guard accentuated by gold stars. As well as its decorative appeal, however, the finished product is also a sporting shotgun of exceptional quality. “It’s a work of art but also a fully functioning sporting gun hand-built to the very highest specifications,” said Andrew Harvison, managing director of Holloway & Naughton®. The gun represents more than a twelve hundred man-hours of effort in its production. Featuring a 12-guage sidelock action and a single inertia trigger, the shotgun has demiblock 30-inch barrels and a tapering solid rib. The gun will be put on display during The Ryder Cup, which takes place from October 1-3 at Celtic Manor, the five-star resort in South Wales. Simon Gibson OBE, Chief Executive of Wesley Clover, the holding company that owns the resort, said: “Celtic Manor’s reputation as a world-class golfing venue will be cemented when it stages The Ryder Cup, but shooting is another popular outdoor pursuit we offer our leisure and corporate clients. “Many people enjoy both sports and there are certainly similarities between the two. The importance of technique and maintaining your powers of concentration are key elements of shooting and golf. Host venue for The Ryder Cup in 2010, the five-star Celtic Manor Resort is set in more than 1,400 acres of panoramic parkland at the gateway to Wales. With two hotels – a 330-room luxury Resort Hotel and an historic 19th century Manor House with 70 rooms – two exceptional spas, two state-of-the-art health clubs, a shooting school, fishing, tennis courts, mountain biking, walking trails and five outstanding restaurants, The Celtic Manor Resort provides a complete experience for business, leisure and golf travellers. The Resort has been voted the Number One Conference Hotel by readers of Conference and Incentive Travel Magazine for three years running from 2007 to 2009. It is the home of The Celtic Manor Wales Open, one of the premier events on The European Tour, and offers the challenge of three 18-hole championship golf courses, including the new Twenty Ten course, the first course in history to be designed and built specifically to host The Ryder Cup. Holloway & Naughton® is a traditional bespoke handmade gun maker, whose origins date back to 1909. The Company has an enviable reputation, equalling if not exceeding the leading London gun houses. In 1995, Andrew Harvison began designing a complete new range of guns, driven by an acute attention to mechanical detail, along with visual design, and achieved by expert craftsmen. This translates into guns with exceptional handling characteristics, combined with extreme artistic beauty. His efforts were recognised by the industry, when Holloway & Naughton® was awarded the Highly Commended, Best New Gun 2006 at the Shooting Industry Awards. With new product launches imminent, the international presence of the Company will undoubtedly continue to expand. Holloway & Naughton ® Gunmakers, Turners Barn Farm, Kibworth Road, Three Gates, Billesdon, Leicestershire, LE7 9EQ, United Kingdom. 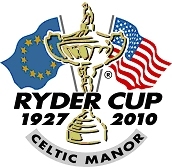 In 2010, The 38th Ryder Cup will be held at The Celtic Manor Resort in Newport, South Wales. The Ryder Cup is one of the major sporting events in the world with an expected global TV audience of 1 billion viewers. To commemorate the event Holloway & Naughton ® have been commissioned to build a Premier Range sporting shotgun. Celebrating the links between shooting and golf, the shotgun will be a truly world-class work of art, showcasing the exceptional artisan skills based in the UK. The internationally acclaimed Welsh engraver Phil Coggan has agreed to engrave the shotgun, using a combination of Welsh and American themes. Shooting and golf are two of the most popular outdoor sporting pursuits and share many skills, particularly the composure and competitive edge required in major tournaments. Celtic Manor, through its Treetops Shooting School, is just one of the world’s leading resorts to offer both activities to its guests and corporate clients. The Holloway & Naughton ® Commemorative shotgun has the essential qualities needed by a top class competitor. This is in keeping with the spirit of The Ryder Cup, and the same exacting requirements of those golf professionals who will participate in the match. It is anticipated that the shotgun, scheduled for completion in June 2010, will be displayed during the prestigious golf tournament which takes place from October 1-3. The Celtic Manor Resort won its bid to host the biennial match between Europe and America back in 2001 when it pledged to build a world-class golf course with supporting facilities including a new clubhouse. These are now complete following the opening of The Twenty Ten Club in 2007, three years ahead of the event. Andrew Harvison, owner of Holloway & Naughton ® is delighted to be working with engraver Philip Coggan, and he is grateful to receive the commission to be associated with one of the world’s greatest sporting events. In 2005 and 2007 the Resort was voted the Number One Conference Hotel by readers of Conference and Incentive Travel Magazine. The Resort is the home of The Celtic Manor Wales Open, one of the premier events on The European Tour, and offers the challenge of three 18-hole championship golf courses, including the new Twenty Ten course, the first course in history to be designed and built specifically to host The Ryder Cup. 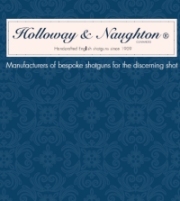 Holloway & Naughton ® is a traditional bespoke handmade gun maker, whose origins date back to 1909. The Company has an enviable reputation, equalling if not exceeding the leading London gun houses. In 1995, Andrew Harvison began designing a complete new range of guns, driven by an acute attention to mechanical detail, along with visual design, and achieved by expert craftsmen. This translates into guns with exceptional handling characteristics, combined with extreme artistic beauty. His efforts were recognised by the industry, when Holloway & Naughton ® was awarded the Highly Commended; Best New Gun 2006 at the Shooting Industry Awards. With new product launches imminent, the international presence of the Company will undoubtedly continue to expand. Holloway & Naughton ®, Turners Barn Farm, Kibworth Road, Three Gates, Billesdon, Leicestershire, LE7 9EQ, United Kingdom.